The Black Belt Citizens Fighting for Health and Justice began organizational meetings in the summer of 2005 to take on the issue of the proposed landfill. Despite widespread opposition, the landfill opened in 2007. When residents learned about the impending coal ash shipments, Black Belt Citizens fought hard to stop TVA and 4 million tons of toxic coal ash from the 2008 Kingston TVA disaster to be dumped in the Arrowhead Landfill. The Alabama Department of Environmental Management gave permission for the coal ash, then allowed under a “special permit” law, and ADEM got $1 a ton for their state agency. From 2009-2010, coal ash was shipped by rail into the community and the near-by residents began to witness horrific pollution problems and became concerned for their health and rights. After a while the meetings grew larger and more regular and the overall plan to fight the landfill grew with identified targets and specific goals. Black Belt Citizens elected William (Bill) Gibbs as their first President in 2010. The struggle in Uniontown isn’t new. Check out this JET Magazine article from the early 70’s describing Uniontown’s political climate. 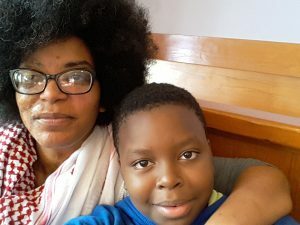 In late 2012, the son of BBC member Esther Calhoun suffered a traumatic experience of police misconduct. 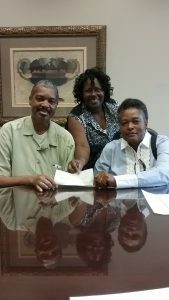 In 2012-2013, Calhoun and other members of the BBC filed a Civil Rights Complaint against the Al Department of Environmental Management (ADEM) for their permit modification of Arrowhead Landfill in 2011 and 2012 to increase in size without adding any further protections for the community. The complainants are being represented by Earthjustice. In 2012, the City of Uniontown was awarded a grant to upgrade the sewage system. In 2013, BBC continued its campaign to protect the community from coal ash including assisting in scientific research, coordinating legal strategies, and hosting media. One group of filmmakers produced, “From The Ash.” In 2013, BBC also began working to assist residents in a campaign to stop construction of another sewage sprayfield. 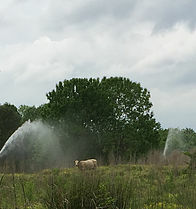 While fighting the 2nd sprayfield, BBC addressed sewage overflows at sprayfield #1. In early 2014, BBC stopped the use of sprayfield #2 but could not stop the daily sewage overflows into Freetown Creek from sprayfield #1. In 2014, BBC learned that the sewage crisis had been ongoing for 3+ decades and they decided it was time to address this form of environmental racism with other strategies. In 2014, BBC elected their first female President, Esther Calhoun, and they elected a new Vice-President Ben Eaton. They soon began to confront and address the Black Belt’s systemic racial injustices. In 2014, BBC hosted schools, students, organizations, and agencies including AL Rivers Alliance, Earthjustice, the US EPA, and the US Military West Point Cadets. The Cadets joined for a civil rights tour where BBC connected environmental justice and the fight for human rights. BBC also hosted and guided another filmmaker, from the Southern Environmental Law Center’s Southern Exposure series, who produced a video about the sewage crisis. In 2014, BBC became more educated and prepared to take on environmental pollution, political corruption, and state violence in Uniontown. On MLK Day, the NY Times ‘Dotearth blog’ described Uniontown as a modern day battleground for civil rights. The article, “In Alabama, West Point Cadets Explore Polluted Civil Rights”​, was written by one of the U.S. Military Academy professors who shared his 2014 experience and visit in Uniontown. Cadence Bank, Uniontown’s only bank announced its immediate closure. BBC, Uniontown residents, and concerned families wrote letters, made calls, and eventually convinced the bank to stay open. An NPR reporter visited Uniontown to cover the story of Arrowhead advertising for more coal ash while the state was under investigation for its permitting. The reporter was taken to water run-off leaving the landfill and nothing was reported in the article. Green Group Holdings joined the World of Coal Ash Conference to continue advertising for coal ash. Here is a copy of their press release from the event. Black Belt Citizens and Al Young, Black & Green hosted Building Bridges for Justice to counter the landfill’s request for more ash. The program was facilitated by Project South: Institute for the Elimination of Poverty and Genocide. The event featured Uniontown residents and allies from around the SE including: Statewide Organizing for Community eMpowerment, Hands Off Appalachia, Federation of Southern Cooperatives, Al Sierra Student Coalition, Al Rivers Alliance, Magic City Agriculture Project, Al Sustainable Agriculture Network, and Southern Alliance for Clean Energy (SACE). Here’s a small recap from SACE about the event. Black Belt Citizens held a press conference on the steps of the Uniontown City Hall to address concerns with the cemetery and landfill, the sewage overflows, and the odors from the cheese plant. The BBC allies that supported the day’s events were Earthjustice, Al Sierra Student Coalition, and the Tn Sierra Student Coalition. Watch this small video by an UNA student who captured her experience. Al Jazeera America wrote a piece covering wastewater problems in Uniontown and around Al’s Black Belt region entitled, “Filthy water and shoddy sewers plague poor Black Belt counties.” The reporter stated the overflows of raw sewage pose serious health risks, including returns of diseases thought eradicated in the US. President Calhoun traveled to North Carolina to address the Lee County NAACP and the Blue Ridge Environmental Defense League about NC’s proposals for new coal ash landfills near their homes. 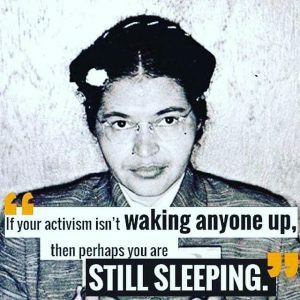 Esther urged the community to keep fighting no matter what! The Southern Movement Assembly held an Organizing Intensive in Uniontown, in part to learn about and support the struggle against environmental violence. The multi-day training was held at historic Quinn Chapel AME Church and included teachings, planning sessions, and a march on City Hall. 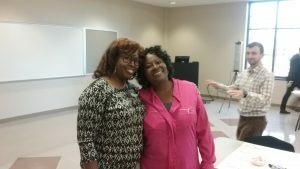 Black Belt Citizens participated in the Alabamians for Restoration Conference, a day of community workshops, cross-sector conversation, and training with a diverse group of partners who united under a common banner to work towards social and climate justice. The conference was organized by the Alabama Center for Rural Enterprise, AL NAACP, Center for Earth Ethics, Equal Justice Initiative, Alabama Rivers Alliance, and the Climate Speakers Network. BBC President, Esther Calhoun, traveled to Montgomery to address the Dalriada United Methodist Church on the dangers and hazards of living near coal ash. 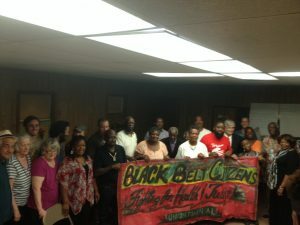 An Alabama Power Company executive met with the Black Belt Citizens and tried to negotiate and offer partnerships. APCO is Al’s largest producer and holder of coal ash. Arrowhead Landfill continued to have unpermitted water run-off at its SW corner and reported trespass inside New Hope Cemetery at its NW corner. Arrowhead released a video with attempts to advertise its landfill as a great corporate neighbor. 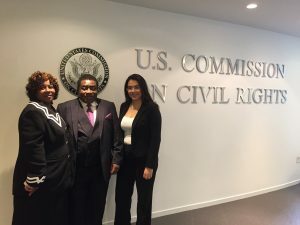 BBC President Esther Calhoun traveled to Montgomery, Al to share her experiences of injustice with the UN Working Group on the issue of discrimination against women. AL NAACP and Black Belt Citizens held a press conference at Pitts/New Hope Cemetery about the on-going trespass and desecration of the Black cemetery by the landfill. BBC participated in 9 national trainings, workshops, and speaking engagements in 7 different states including the US Commission on Civil Rights in Washington DC; the 6th Extreme Energy Extraction Collaborative Summit in PA, the Southern Peoples Organizing Intensive in Atlanta, Southern Movement Assembly VI in Chattanooga, the 47th National Conference for Black Lawyers in Chicago, CoopEcon 2016 in Epes AL, the 20th Southern Human Rights Organizers Conference in Jackson MS, and the US Human Rights Network’s FIHRE, Fighting Injustice through Human Rights Education (FIHRE), Retreat at legendary Highlander Research and Education Center in TN. Black Belt Citizens and Al Young, Black & Green hosted Building Bridges for Justice, MLK weekend, featuring a tour of Uniontown, Saturday Prayer Supper, community listening session, and cultural infrastructure workshop with a focus on civil rights, environmental justice, and community empowerment. BBC President Calhoun traveled to Washington DC on request from the US Commission on Civil Rights to share testimony about living with toxic coal ash. The USCCR stated they would visit Uniontown and investigate Arrowhead. Reporters from the Center for Public Integrity continued their coverage on EPA’s handling of coal ash and environmental justice. BBC President Calhoun addressed the Southeastern Student Summit for Justice and rallied students from multiple campuses against dumping coal ash in Uniontown. Calhoun’s presentation inspired one of the students to submit a news article. BBC hosted another Building Bridges for Justice program bringing together community members and different organizations to analysis and plan for health and justice. The event was scheduled for the visit of the US Commission on Civil Rights and included a fish fry. Arrowhead Landfill’s attorneys filed a slapp lawsuit against 4 Uniontown residents and members of BBC for alleged slander. BBC hosted Unitarian Universalist Fellowship of Montgomery for a Fighting for Human Rights Tour. 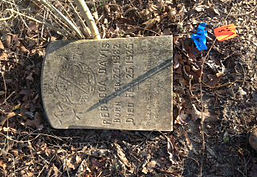 Groups visited the sewage sprayfields and New Hope Cemetery where they noticed recent bulldozer work and a parked bulldozer inside the cemetery. BBC President Calhoun and Coordinator Johnston traveled to Pennsylvania to join the Extreme Energy Extraction Collaborative Summit. BBC connected with community leaders and environmental justice experts from across North America in a 4 day workshop. ACLU filed for dismissal of the landfill’s slander suit. 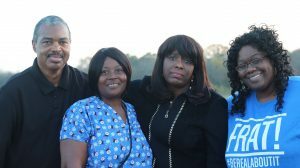 Their piece, “This Poor, Black, Polluted Alabama Town, Speaking Up Gets You Sued,” can be found at this link. 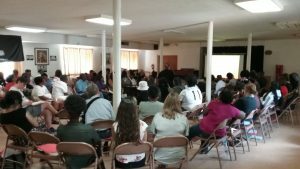 Black Belt Citizens joined the Southern People’s Initiative in Atlanta, Ga with Project South, the Southern Movement Assembly and over 65 freedom fighters to plan community-determined solutions in this time of crisis. BBC President Calhoun attended the US Human Rights Network’s FIHRE, Fighting Injustice through Human Rights Education (FIHRE), Retreat at legendary Highlander Research and Education Center to plan a human rights campaign and tactics for Uniontown. BBC and Federation of Southern Coops hosted “Growing Local Farmers” which brought together 35 farmers, community leaders, government agency staff, and organization’s from Al’s Black Belt region to discuss black land loss, growing small businesses, family farms and cooperative models, and more. BBC and allies confirmed the need to work for economic justice in the Black Belt with programs for the youth and those most impacted. BBC and the US Human Rights Network hosted a community program, “Clean Water and Working Sanitation NOW” featuring a community tour, solidarity action with BBC, and community tribunal. The people’s action was scheduled for and located at the City Council meeting and may have influenced its sudden cancellation. BBC and Project South hosted the Uniontown Assembly and political forum at Quinn Chapel AME. The community program united people from Uniontown in the creation of a shared political platform. Uniontown Assembly & Political Forum II brought together 45+ Uniontown residents who demanded transparent justice from the 1 candidate (not the incumbent) who attended. The forum took place after the City Council meeting in City Hall and was once again moderated by Pastor Howze of Quinn Chapel AME Church. 5 BBC members attended and participated in the Southern Movement Assembly in Chattanooga, Tn along with 350 other freedom fighter. The participants gathered together for over 13 hours of assembly and even more of fellowship to raise our consciousness, craft our visions, and to strategize our path forward together for a better South. BBC President and founding member attended and presented at the National Conference of Black Lawyers in Chicago, Il. BBC members joined the CoopEcon workshop hosted by the Federation of Southern Cooperatives to learn about cooperative development in the Black Belt. 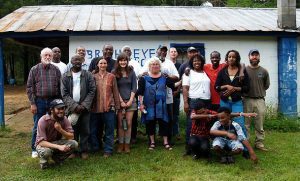 BBC helped create and host the Boykin Peoples Movement Assembly in Gees Bend focusing on protecting water, land, and culture. 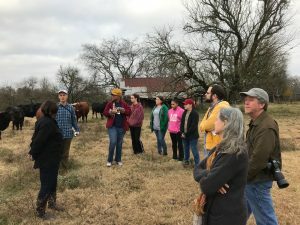 The event was co-created by the Boykin Improvement Association, Project South and US Human Rights Network and the program included an assembly-style discussion, shared lunch, and farm tour. 4 BBC members attended the 20th Bi-Annual Southern Human Rights Organizer’s Conference (SHROC) at historic Tougaloo College in Jackson, Ms.
BBC members led and/or participated in 40+ programs centered around health and justice. BBC Officers met at least 20 times to strategically guide the organization. Members attended all 17 City Council meetings and led and/or hosted 4 educational meetings with elected officials. BBC conducted 10 events with Churches and their congregations, 10 community-based programs in Uniontown with schools and organizations, and 8 programs at Uniontown’s City Hall immediately following eight City Council meetings. Members of BBC attended over 5 trainings outside Uniontown including Mobile, Tuskegee, Atlanta, North Carolina, and Vermont. January 20, on the day of the Presidential Inauguration, Black Belt Citizens met to strategically plan 2017 goals. On January 21, over a dozen BBC members, young and old, joined the “Black Belt Social Change Leaders” program in Selma hosted by the National Committee for Responsible Philanthropy, the Black Belt Community Foundation, and the Grantmakers for Southern Progress. Below is a picture of BBC President Esther Calhoun and Selma native LaTosha Brown. 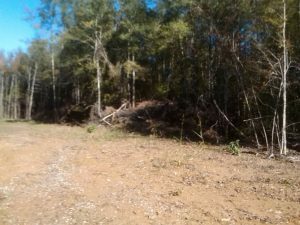 The AL Department of Environmental Management (ADEM) approved and renewed the landfill’s permit for another 5 years. On the same day, BBC hosted a learning tour of the failed sewage sprayfield with professors, engineers, and local experts. On February 11, BBC met to protect and defend the community from the landfill and state government. BBC hosted the first economic training for their Green Jobs Development Program with partners Federation of Southern Cooperatives and Democracy at Work Institute. BBC President Calhoun and Uniontown resident E. Long traveled to Vermont for the 2017 Solutions Conference hosted in part by the Vermont Law School’s Black Law Students Association. Please see BBC President during this video of the “Community Voices Panel”. BBC hosted New Beginnings Ministry’s (from Brighton, Al) youth group and the Al Sierra Club’s Birmingham ICO program in Uniontown for 2 days of community living and programming. The weekend’s programs were captured by ‘Portia Takes on the Black Belt’s’ BBC Show. Report featuring philanthropy in the South, “As the South Grows”, released about funding grassroots and featured BBC’s President. BBC traveled to Montgomery and opened account at a minority-owned bank. BBC hosted University of AL Huntsville for community health research and education. BBC hosted BWRK for a strategic meeting in Uniontown. 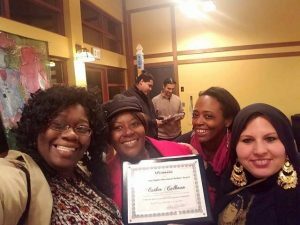 Five BBC members traveled to Clarkston, Ga for Southern Peoples’ Organizing Intensive training with Women Watch Afrika, Project South, and the Southern Movement Assembly. BBC welcomed US Senator Cory Booker (D-NJ) and many special guests to Uniontown for day 1 of their Southeastern environmental justice learning tour. BBC members toured the Senator’s staff, Hip Hop Caucus, Now This News, National Geographic, Yale Law School’s Environmental Justice Clinic, Earthjustice, Shepherd Productions, and others to the cheese plant, the sewage sprayfields, the landfill, and New Hope Cemetery. Please see Shepherd Productions “Waking Up the Black Belt” for more. BBC attended the Uniontown City Council meeting and then hosted the ACLU of AL for a “Know Your Rights, Uniontown” training. It was standing room only in the Council meeting that was jam-packed with discussions and topics as well as people. ACLU of AL’s Policy Director and one of their intern joined the meeting plus many BBC members. The Council motioned to increase residential water bills. Perry County Commission Chair, Miller, who represents the area around the landfill was present with the landfill’s attorney to further spin the landfill’s perception in the community. The Council also went into an extended period of Executive Session. The overall council meeting ended at 8 PM. The BBC and ACLU program was previously and publicly announced for 7 PM and/or immediately following the Council meeting. BBC members felt the meeting was extended to hurt the KYR training. BBC members also learned that the Mayor planned and promoted a “free food” give-away on the other side of town at the same time of the KYR training. “Out of the Struggle: Strengthening and Expanding Movement Journalism in the U.S. South,” published by Project South and featured BBC and Esther Calhoun’s use of non-traditional media. BBC members attended Uniontown’s Council meeting then hosted Salaam Green and Literary Healing Arts for “Health and Healing, Uniontown.” On August 21, BBC members attended Uniontown’s Council meeting then hosted Portia Takes on the Black Belt for “Hands Off the Black Belt”. BBC attended Uniontown’s Council meeting then hosted Green Jobs Development program with Federation of Southern Cooperatives with guests Boykin Improvement Association. 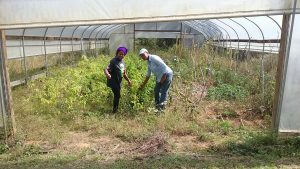 BBC members toured two Black Belt farms as part of the BBC Green Jobs Development Program. Environmental Justice Act of 2017 released. November 6, BBC hosted voter drive and then hosted ACLU of AL for “Know Your Rights.” On November 7, BBC hosted Funders for a Just Economy for a learning tour and community discussion. BBC hosted US Congresswoman Sewell for discussion about Uniontown’s sewage problems. 4 BBC members attended the US Human Rights Convening in Atlanta. December 9, BBC President, Esther Calhoun, was awarded the 2017 Human Rights Defender Award. BBC members led and/or participated in 35 programs in Uniontown and Alabama’s Black Belt centered around health and justice. BBC Officers and Coordinator met at least 15 times to strategically guide the organization. Members attended all 19 City Council meetings and participated in 5 educational programs with elected officials. 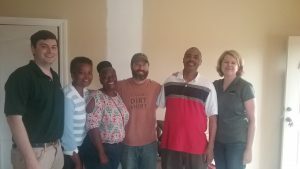 BBC members conducted 10 events with faith-based groups in Alabama’s Black Belt and Churches in Uniontown and the surrounding area including their congregations. Members of BBC attended 10 trainings in North Carolina, New York, Tennessee, Detroit, Missouri, Mississippi, Maryland, Louisiana, and Wisconsin. BBC participated in 20 voter education work days and 10 green jobs work days. January: From January 13-15, BBC hosted eight young organizers from Mobile and Birmingham for discussions and planning how to support each other. On January 15, MLK Day, BBC held a strategic meeting in Uniontown and then visited the Boykin Improvement Corporation’s meeting. 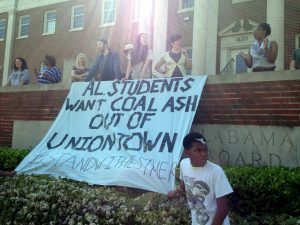 March: The U.S. Environmental Protection Agency closed Uniontown residents’ discrimination complaint against the state of Alabama Department of Environmental Management stating “insufficient evidence” on March 2. From March 2-3, BBC hosted partners from Mobile in Uniontown during the annual Bloody Sunday programs in Selma. April: On April 7, Piggly Wiggly closed and the Selma Times Journal covered the event, “Lone Grocery Store in Uniontown Closes Down.” From April 24-25, BBC’s Green Jobs Development Program planted 100 blueberry bushes around Uniontown. May: BBC President, Esther Calhoun, was featured in the May edition of the Essence Magazine article, “Meet The Women Who Turned The Tide In Alabama”. From May 9-10, BBC hosted organizations, Campaign Legal Center, The Ordinary People Society, and the Extreme Energy Extraction Collaborative to register voters in Uniontown. On May 10, BBC organized a Political Forum in Uniontown to educate and engage voters in the June 5 Primary Election. Members of BBC conducted voter education work days on May 16, 18, and 24 and organized another Political Forum on May 25. June: On June 5, the same day as the Primary Election, the AL Department of Environmental Management revoked their own “Civil Rights and Environmental Justice Complaint Reporting and Investigating Process” due to improper implementation. On June 5, the people of Perry County voted and elected a new commissioner for Perry County District 5, Ben Eaton. On June 6, professors from Auburn University, University of Alabama, and University of South Alabama sent a letter to Uniontown’s Mayor and advised the City to seek a second engineering opinion for the needed wastewater solutions. July: From July 18-19, BBC hosted the Performing Our Future program in Uniontown. The workshop brought together groups from California, New York, Wisconsin, Maryland, Kentucky, and Alabama to learn, share, and build. August: From August 15-16, BBC hosted the Southern Poverty Law Center’s AL Voting Rights Project (AVRP) for voting rights work in Uniontown, Demopolis, Marion, and Greensboro. September: From September 4-6, BBC hosted Stateline media for a story on Uniontown’s pollution problems. 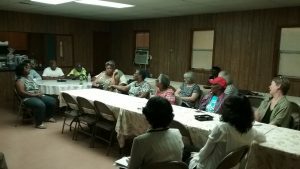 On September 5, BBC met with members of the Ashurst Bar Smith Community Organization in Selma to discuss environmental justice. October: From October 5-7, BBC members attended the National Creative Placemaking Summit in College Park, Maryland. 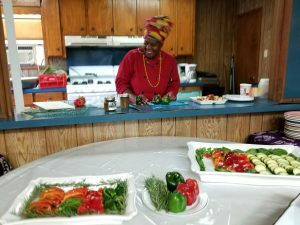 On October 8, BBC hosted Church Women United Montgomery at Uniontown Church of God for amazing fellowship, mutual learning, and visiting sites of pollution and injustice. After the gathering, BBC traveled to Wilcox County and attended a special community meeting held by the Boykin Improvement Corporation. November: On November 14, members of BBC attended a special dedication for Perry County Commissioner Districts 4 and 5 then hosted a community celebration for District 4 and 5 at Chatinos Mexican Grill in Marion. Students from Judson College in Marion visited the Uniontown sprayfield and sampled overflows again on November 15. November 16, members of BBC and residents of Uniontown attended a special stakeholders meeting at the U.S. Department of Agriculture office in Montgomery to discuss Uniontown’s sewage problems and proposed plans. Also on November 16, BBC and partners attended and presented at the Peoples’ Tribunal held at Alabama State University as part of the 8th International Conference on Critical Dietetics. 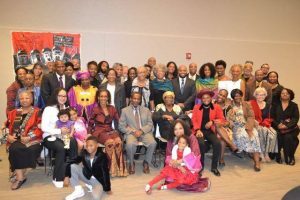 December: On December 14, BBC hosted a special community celebration at Quinn Chapel AME Church in Uniontown to highlight the efforts of residents and partners and then traveled to Greensboro to visit the Safe House Black History Museum. On December 22, 10 years after the TVA Coal Ash disaster, BBC and partners published a video of the pollution in Uniontown.